Interstate 75 has an array of business loops in Georgia, Ohio and Michigan. 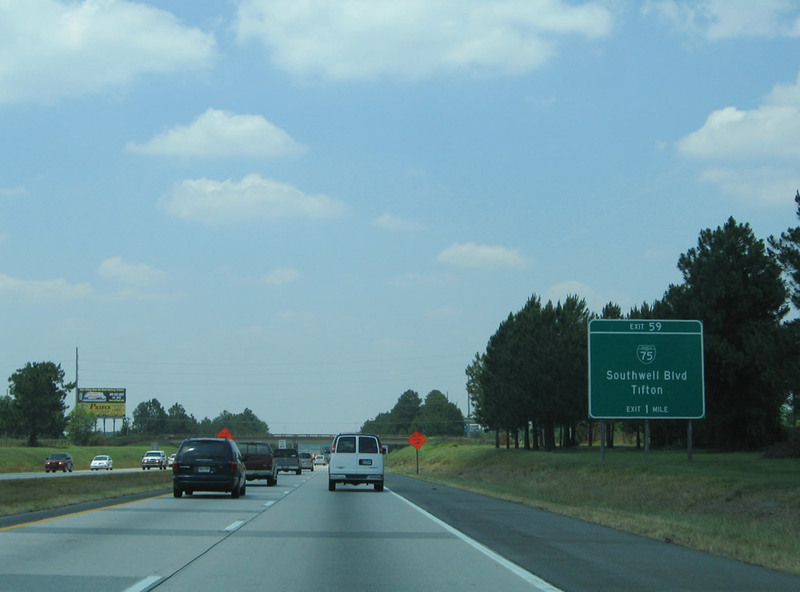 The 1998 Exit Authority Guide verified the existence of many of the southern Georgia business loops off Interstates 75 and 95. The loop accompanies U.S. 84 & 221 east from Exit 16 along Hill Avenue to Downtown Valdosta, and U.S. 41 north along Ashley Street and Valdosta Road to Exit 22.
Business Loop I-75 is shielded along Hill Avenue and in the Valdosta central business district, but unsigned elsewhere along the route. Exit 22 overheads along I-75 reference the route, but northbound signs at Exit 16 do not. This loop ran along U.S. 41 (Goodman Street / Hutchinson Avenue) from Sparks to Adel. Colquitt Street carried the route west to Exit 41 of I-75. A remnant of the former loop exists on southbound Exit 41 guide signs where a blank space once displayed a Business Loop shield. Old Quitman Road likely returned the loop to Exit 37 on the south side of Adel. The Tifton business loop follows U.S. 41 north from Southwell Boulevard along Main Street, Love Avenue and 12th Street through the city of Tifton. The route is unsigned outside of guide signs on I-75 north at Exit 59 and south at Exit 64. The 7.2-mile loop through Cordele commenced at Exit 101 with U.S. 280 & Georgia 30-90 along 16th Avenue west into Downtown. U.S. 41 carried the route northward along 7th Street to an exit of the city to Farmers Market Road. Farmers Market Road east to Exit 104 returned the loop to I-75. A lone shield remains along this route westbound along U.S. 280 (it was removed after 2010 but restored by 2013). An Interstate 75 trailblazer posted along U.S. 280 erroneously displays a Business Loop shield on eastbound as well. Overheads along I-75 south include space allocated for the business route, but no shield. 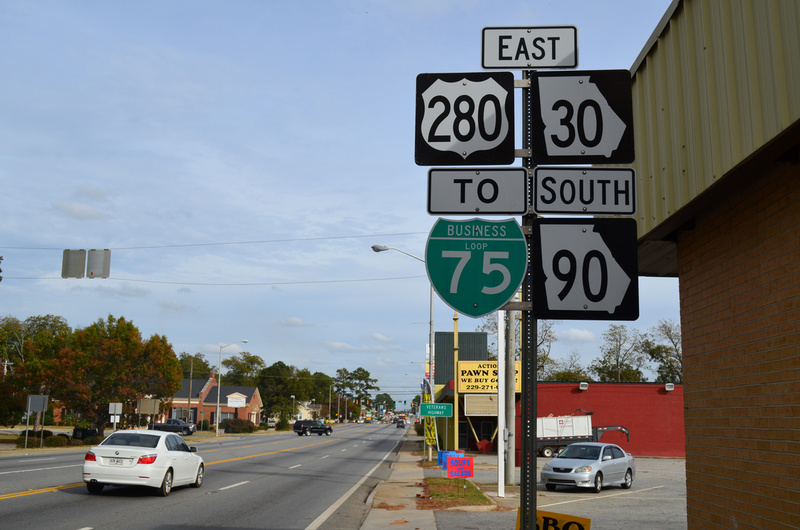 The Interstate 75 Business Loop is still sparsely signed along its route in Cordele, GA, including a very faded shield that looks to be an original install. The 8.9 mile route of Business Loop I-75 followed old U.S. 25 between Exits 69 and 78. County Road 25A, named because U.S. 25 was still posted in Miami County at the time, stems north from I-75 along former U.S. 25 through suburban areas north of Tipp City to Market Street in south Troy. CR 25A transitions into Market Street northwest to Ohio 55, which follows the street northeast to Downtown. A traffic circle joins Ohio 55 (Market Street) with Ohio 41 (Main Street) in the Troy business district. There Business Loop I-75 turned west and overlapped with SR 41 on Main Street to Elm Street north. Beyond the city line, County Road 25A resumes as the name of old U.S. 25 as it parallels the Great Miami River north to I-75. Harrison Page noted at least a dozen shields for Business Loop I-75 in the early 2000s. Of these, only three were posted outside the Troy city limits and none at the traffic circle between Main and Market Streets Downtown. The route is also unmarked on guide signs for the respective County Road 25A exits. County Road 25A continues north from Exit 78, where the Troy business loop ended as the Piqua business loop. The 5.3 mile route takes Main Street through the city. Ohio 66 begins at U.S. 36 (Water Street) in Downtown and lines Main Street north to Riverside Drive. Upon crossing the Great Miami River, North Main Street becomes Miami County Road 25A again as it arcs east back to I-75 at Exit 83. The route is no longer posted from the I-75 mainline or along Main Street in Piqua. Business Loop I-75 traveled a 4.4 mile route wholly within the city of Sidney. The east-west leg overlapped with Ohio 47 (Michigan and Court Streets) between Exit 92 and Downtown. A one-way couplet (Main Avenue north / Ohio Avenue south) took the route north along side Ohio 29 to Wapakoneta Avenue. Ohio 29 south joined Business Loop I-75 from Pike Street east while northbound overlapped with the route to Russell Road west. Wapakoneta Avenue (old U.S. 25) heads north to meet I-75 at Exit 94, where Business Loop I-75 ended and County Road 25A resumed. Reassurance markers and directional shields remain posted as recently as 2015 along SR 47, in Downtown and along Wapakoneta Avenue. Guide signs on I-75 dropped the designation by 2009. Some city installed signs remain posted along Main Street for Business Loop I-75 at Findley. The route is otherwise unposted and not acknowledged from the Interstate 75 mainline. The 4.7 mile loop departs from I-75 at Exit 156 to briefly overlap with U.S. 68 to right in / right out ramps with Lima Avenue. Lima Avenue carries the route northeast to West Lima Street for the connection with Main Street (old U.S. 25). North through Downtown, Ohio 37 combines with Business Loop I-75 (Main Street) from Lincoln Street while Ohio 12 joins the route from Main Cross Street. North across the Blanchard River, Ohio 12 turns east along side U.S. 224 (Center Street) while Ohio 37 ends. U.S. 224 west & Business Loop I-75 overlap northward from there on Main Street to the University of Findlay and Trenton Avenue west. Trenton Avenue leads both to I-75 at Exit 159, where the business loop ends. This alignment was never posted as Business Loop or Spur I-75, but is a part of an Emergency Detour route for the freeway. Business Loop I-75 arcs west from I-75 to the city of Pontiac along a 10.27-mile route.2 The route travels a freeway west from a directional T interchange (Exit 75) to Square Lake Road and U.S. 24 Business. Turning north, Business Loop I-75 & U.S. 24 Business overlap along Woodward Avenue to Downtown where they separate into a one-way couplet encircling the central business district. Perry Street branches northeast from the downtown loop to become Lapeer Street at the Auburn Hills city line. Lapeer Road passes under I-75 without direct access before meeting a trumpet interchange and access road leading Business Loop I-75 back to the freeway at Exit 81. Established in 19603 and decommissioned in October 1971, the Saginaw business loop for I-75 followed M-46 (Remington Street west / Holland Avenue east) from Exit 149 to Genessee Avenue, the former alignment of U.S. 23 Business north. U.S. 23 Business traveled north along Genessee Avenue to a one-way couplet with Janes Avenue east through Downtown Saginaw. M-13 & 81 joined U.S. 23 Business north along Washington Avenue to Veterans Memorial Parkway. U.S. 23 Business & M-13 returned Business Loop I-75 to I-75 via Veterans Memorial Parkway and Exit 153. This routing is shown on the 1969 R.R. Donnelley & Sons Company Michigan map base. Business Spur I-75 stems east from Exit 162 along M-25 to Downtown Bay City. The 3.05 mile route links I-75 with the couplet of Thomas Street east and Jenny Street west via a limited access highway. The one-way pair recombine at the Veterans Memorial Bridge across the Saginaw River. Business Spur I-75 separates again from the span to end at M-84 (Washington Street) along a two block section of McKinley Street east and 7th Street west. Guide signs along I-75 & U.S. 23 omit Business Spur I-75 for Exit 162 and only display M-25. The full cloverleaf interchange doubles as the eastern terminus of U.S. 10. Prior to 1971, Bay City was served by a full Business Loop from I-75. 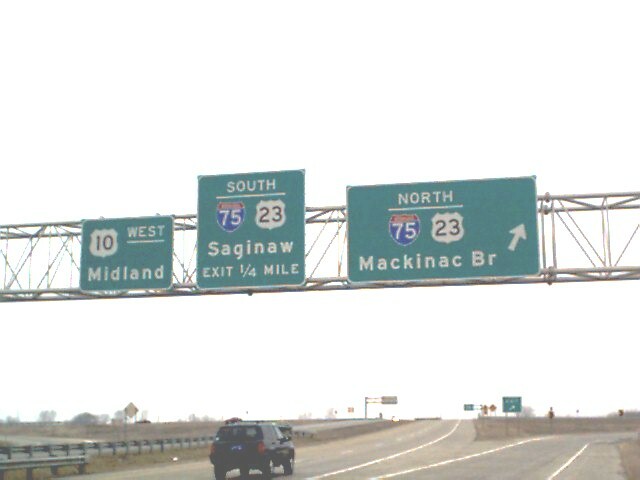 The loop branched northeast from Exit 160 along Saginaw Road to Salzburg Avenue. Salzburg Avenue extended the route east across the Saginaw River to Lafayette Avenue and Garfield and Washington Avenues turned the loop north to the current east end of Business Spur I-75. This was all redesignated as a northern extension of M-84. Interstate 75 bypasses the small city of West Branch to the southwest. Business loop I-75 connects the freeway with the Ogemaw County seat along a 5.34 mile2 alignment north from Exit 212 and east from Exit 215. The business route runs north by an outlet mall and big box retail area to overtake old M-76 into West Branch. Business Loop I-75 combines with M-55 (Houghton Avenue) west through the city center and back to I-75. Roscommon is a village located east of Interstate 75 between Exits 239 and 244. A 6.82 mile2 business loop provides a direct route to the business district along M-18 (Lake Street) north and over former M-76 (5th Street) west. 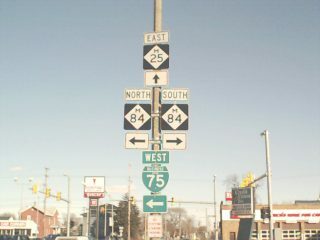 Business Loop I-75 through the city of Grayling follows old U.S. 27 north from a wye interchange (Exit 254) to Downtown. There M-93 combines with the route along McClellan Street north to Grayling Army Airfield and Interstate 75 at Exit 259. 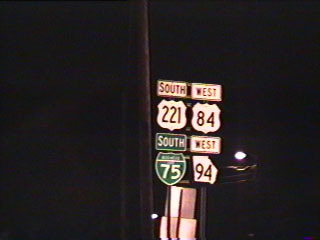 Old U.S. 27 separates with the business loop at Airport Road and stays west of the freeway en route to Frederic. Old U.S. 27 crosses paths with Interstate 75 at Exit 279 to become a part of Business Loop I-75 north through the city of Gaylord. 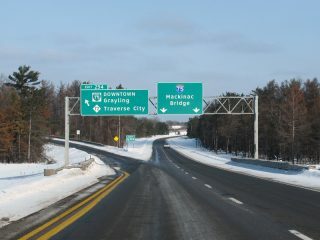 The 3.39-mile route2 follows Otsego Avenue north to M-32 (Main Street), where it turns west to end at the commercialized interchange (Exit 282) with I-75. Old U.S. 27 otherwise shifts two blocks east on M-32 to Center Avenue north. The Cheboygan County Road Commission eventually discussed the possibility on June 2, 2016. 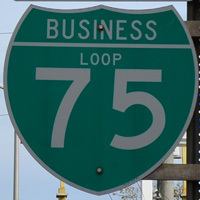 Despite a petition garnering signatures from many Indian River business owners,6 the business loop cannot be signed unless MDOT accepts control of old U.S. 27 (Straights Highway), as all Interstate Business Routes in Michigan are a part of the state trunk line system. Business Loop I-75 follows old U.S. 2 east from Exit 345, just north of the Mackinac Bridge. The 4.66 mile route2 winds along East Moran Bay and the Lake Michigan shoreline through the St. Ignace business district. The loop returns to I-75 at Exit 348 by Evergreen Shores. Business Spur I-75 angles northeast from Exit 392 along a commercial arterial to Ashmun Street in Sault Ste. Marie. Ashmun Street comprises the main north-south street through the city. It doubles as Business Spur I-75 to Portage Avenue in Downtown. Portage Avenue parallels the St. Marys River southeast to the Sugar Island Ferry Dock, where the 5.87 mile route2 of the business spur ends. 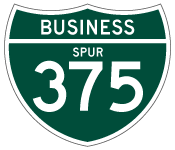 Business Spur I-375 appeared on the Rand McNally North American Road Atlas throughout the 1980s, but it was never signed in the field. Bessert, Chris. “Michigan Highway News – 2001 Projects, etc. [long].” Online posting. 11 Nov. 2000. misc.transport.road. Michigan Highways: Route Listings: US-23. “Resident proposes I-75 business loop in Indian River.” Cheboygan Daily Tribune, June 19, 2015. 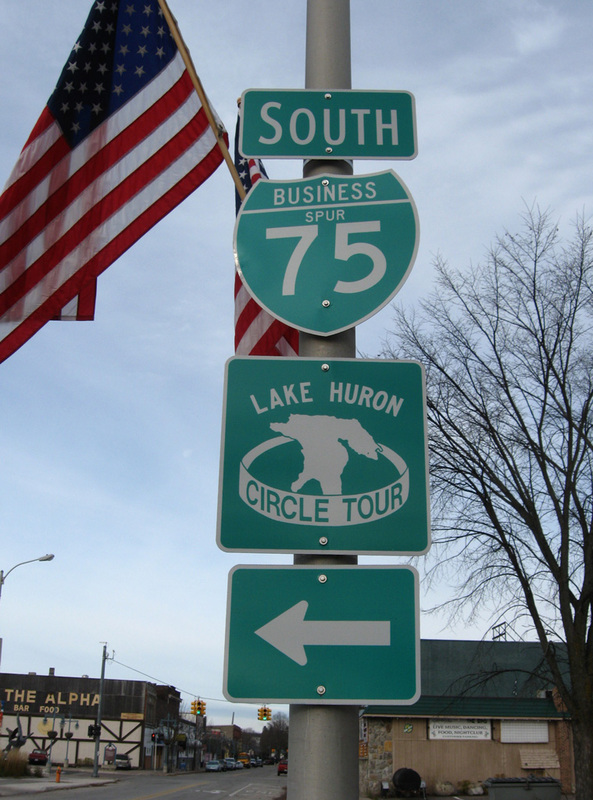 “Public hearing to address I-75 business loop.” Cheboygan Daily Tribune, May 6, 2016. Shield assembly posted along Central Avenue west as Business Loop I-75 combines with U.S. 84 & 221 from Downtown Valdosta to I-75. Georgia 94 was removed from this overlap by 2008. Vidcap from 08/96. Approaching the Tifton, Georgia business loop on Interstate 75 north back when the freeway was still only four lanes wide. Photo taken 05/28/05. 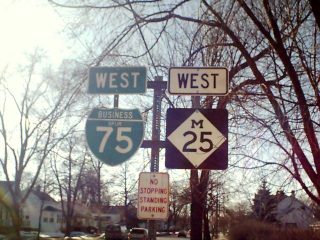 Business Spur I-75 (McKinley Street) east ends as M-25 intersects M-84 (Washington Avenue) in Downtown Bay City. A trailblazer directs motorists onto M-84 north for the westbound beginning of the business spur on 7th Street. Photo taken Walter R. and William Stasinowsky (02/01). 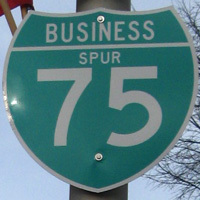 Business Spur I-75 and Michigan 25 reassurance markers on Jenny Street west in Bay City, Michigan. Photo taken Walter R. and William Stasinowsky (02/01). Business Spur I-75 & M-25 conclude at the cloverleaf interchange with I-75 & U.S. 23 as the freeway transitions into the westbound beginning of U.S. 10. Photo taken Walter R. and William Stasinowsky (02/01). Interstate 75 northbound at the Grayling, Michigan business loop. Photo taken by Roadgeek31 (02/03/09).